The last couple of months have tested investors. In a sense, we all got lulled by the wonderful returns of last year and any hiccup was bound to create some stress. The talk at the end of 2017 was all about tax cuts and the short-term boost that lower tax rates would provide to consumer spending and the bottom-line of US corporations. For the first month of the year, things couldn’t have been going better for equity investors. Bond investors while not exactly sitting in the catbird’s seat were slowly adapting to the inevitable rise in yields. Emerging market equities, in particular, jumped ahead and the mood among global investors was one of optimism. Market commentators were even talking about a stock market melt-up! Two months later the mood has changed drastically. Investors are nervous and we have already witnessed two small corrections in the equity markets. 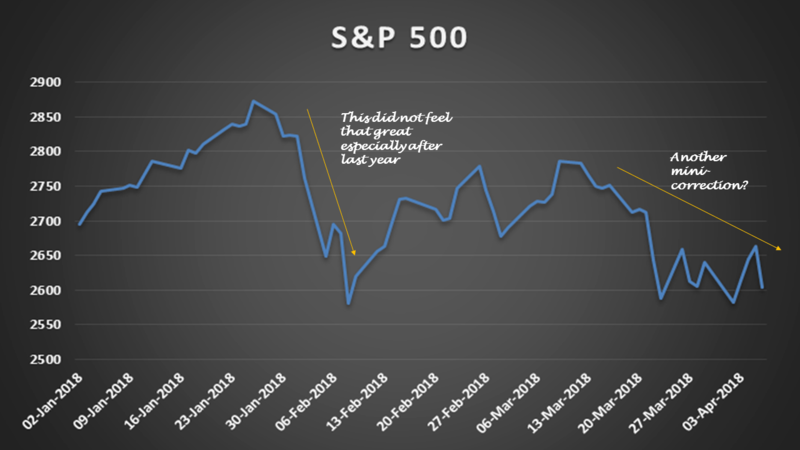 The first mini-correction attributed to rising inflationary expectations took the S&P 500 from a peak of 2873 on January 26 to a low of 2581 on February 8. The 11% drop while not unprecedented was keenly felt by investors accustomed to the record low levels of volatility seen in the last year. It felt like going from a newly paved highway to a dirt road without any warning signs! Were rising inflationary expectations to blame for the early February stock market fall? Our research did not support this story. 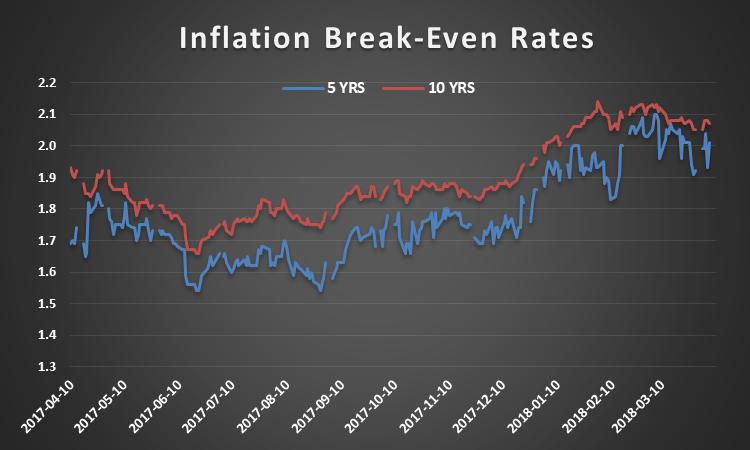 We had been seeing a slow rise in inflationary expectations for about a year but US Inflation Protected Note prices containing the market’s consensus forecast of inflation over the next 5 and 10 years did not exhibit any significant upward pressure. Inflation in the US seems to be fairly range bound with the latest year over year reading of 2.3% (February). Inflationary expectations as of April 6 for the next 5 years stand at 2.0% and for 10 years out at 2.1%. The market implied forecast may turn out to be too benign, but for now, our own view of economic conditions in the US is closely aligned with these market-based expectations. A number of events could have caused the early February correction, but in the context of long-term capital market history, we think that this episode will appear as a mere blip on price charts. Rising inflationary expectations do not seem a likely culprit for this episode of equity market stress. What about the most recent late March equity market drawdown? US equity market markets staged a strong recovery from the February lows with the S&P 500 having recovered all but 3% of the losses from the January 26 peak. Since early March the global markets have, however, been on a roller coaster ride. Up one day, down big the next. As of April 6, the S&P 500 has lost over 6% since March 9. The second mini-correction of the year has re-tested the resolve of equity investors. Volatility levels have jumped up and have risen significantly from the lows of 2017. 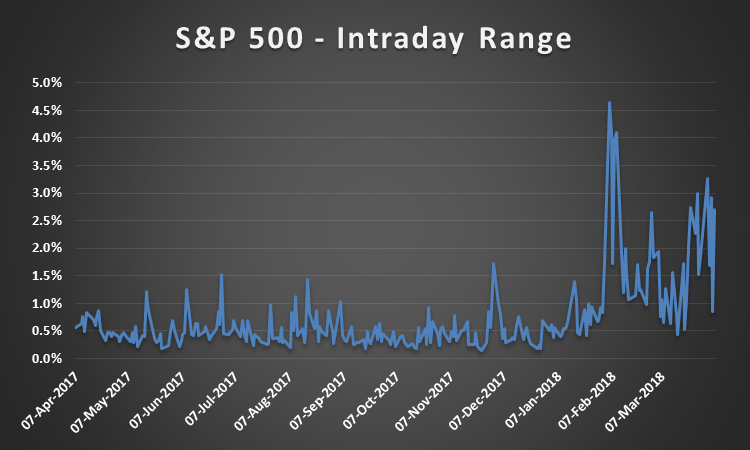 The intraday movement of markets (the difference between the high and low of the day) has been about 2X that of normal periods and 4X that experienced last year. Market volatility has been historically low over the last few years but the large intraday swings we have been seeing this year are distressing to even seasoned investors. John Bogle in a recent interview for Marketwatch commented that he had not seen such a volatile market in his lifetime. He was referring specifically to the huge intra-day moves seen over the last two weeks. What has caused this recent bout of stock market volatility? As always there are many possible reasons, but this time around we see a more direct link to the uncertainty surrounding a possible global trade war. Markets do not react well to uncertainty especially to events that are both hard to quantify in terms of the probability of occurrence and the magnitude of consequences. Trade wars are not everyday events. The last time wholesale tariffs were imposed in the US happened in 1930 when the Smoot-Hawley Tariff Act was passed. While economists will debate whether the Act exacerbated the Great Depression, in general, it is acknowledged that tariffs limit economic growth. Free-trade has been a goal of most nations for the last 50 years. Gains from free trade provide a win-win outcome enabling producers to focus on goods and services where they enjoy a comparative advantage and consumers to reap the benefits through lower costs is one of the strongest held beliefs of modern economics. Global trade of goods and services currently accounts for 27% of worldwide output (according to the OECD). Disrupting global trade by imposing tariffs on a large number of items seems reckless. It is especially reckless when considering that we picked a fight with the world’s largest economy – China. China also owns 19% of the outstanding supply of US Treasuries. No doubt Chinese trade practices are unfair to US companies. Forcing US companies to transfer technical know-how to Chinese firms seems especially egregious given the state of China’s economic development. China is the largest global economy and many of its technology companies are already global powerhouses. Another bone of contention for some is the under-valuation of the yuan. An undervalued currency is a huge weapon for increasing the attractiveness of a country’s exports. However, it is not clear that the yuan is under-valued. According to an IMF report in July of 2017, the fair value of the yuan was roughly in line with market prices and fundamentals. However what really got the capital markets in a tissy was the announcement on March 22 of tariffs on $50 billion worth of Chinese imports. The fight was on and it did not take very long for Chinese authorities to retaliate with in-kind tariffs on US goods. The S&P 500 dropped 2.55% on March 22 and 2.12% on the next day. Likewise, Chinese equity markets reacted quite negatively to the possibility of an all-out trade war with the US with the iShares China Large-Cap ETF (FXI) dropping 3.8% and 2.4% respectively on those days. Where is this all going to end up? In an all-out trade war like after the passage of the Smoot-Hawley Act? Or, in serious bilateral negotiations between the US and China? Our guess is that there are enough rational agents in both the US and Chinese administrations to avert an all-out trade war, but getting the negotiations going will not be easy and will take time. China has already requested negotiations through the WTO Dispute Settlement Mechanism. Luckily there is at least a 60 day comment period separating talk and action. The US is not likely to be a winner in a global trade war. Nobody is really. The most likely outcome is lower overall global growth and increased uncertainty – not a good recipe for capital markets especially in light of current above-average valuation levels. The main problem for the US is that as a nation we are not saving enough. The current net savings rate as a function of GDP currently stands at 1.3%. This number has been steadily trending down – the average since 1947 when numbers were first compiled is 6.6%. The US balance of payments and trade deficits are a function of the imbalance between domestic savings and our thirst to grow and consume. In 2017, the US had merchandise trade deficits with 102 countries. China is not our only problem! Let’s hope that cooler heads prevail and that the disruption to global trade proves minimal. Some of the damage has already been done as uncertainty has engulfed global capital markets. The real economic damage of a global trade war is likely to be substantial. Both equity and bond markets would come under significant stress. Equities would likely take the most immediate hit as earnings growth, especially for multi-nationals, would drop significantly. Bonds are also likely to take a hit as a likely reaction by the Chinese authorities would be to decrease their investments in the US Treasury market. Interest rates in the US would likely jump up causing pain to fixed income investors as well as worsening the federal budget deficit. What do we expect in the intermediate-term from capital markets? While all this talk about trade wars and inflation scares may fill our daily news capture, it is worthwhile to remember that fundamentals drive long-term asset class performance. In the short-term, capital markets can be heavily influenced by changing investor sentiment, but over the horizons that truly matter to most investors most periods of capital market stress tend to wash out. Our current capital market perspectives assume that a trade war will not materialize. Our views are informed by a number of proprietary asset class models updated as of the end of March. What should individual investors do while politicians flex their muscles? For starters evaluate your goals, risk attitude, spending patterns and investment strategy. Make sure that the shoe still fits. Capital markets are not static and neither are personal situations. A long-term orientation and tactical flexibility will be a necessity for investors as they navigate what we think will be difficult market conditions over the next decade. Such an approach will be especially important for individuals near or already in retirement. The sequence-of-returns-risk is especially important to manage in the years surrounding retirement when the individual will start drawing down savings. Our approach at Insight Financial Strategists explicitly deals with this type of sequence-of-returns-risk by building the individual’s portfolio around the concept of goal-oriented buckets. Each bucket has a distinct goal and risk profile. The short-term bucket, for example, while customized for each individual, has the overriding goal of providing a steady stream of cash flow to the individual. This is the safe money designed to exhibit minimal volatility. The goal of the intermediate-term bucket is different – this part of the portfolio is designed to grow the purchasing power of the individual in a risk-controlled manner. A sometimes bumpier ride is the price of growth for this bucket but the rewards should be more than commensurate with the additional risk taken. Finally, the long-term bucket is designed to maximize the long-term appreciation of this portion of the portfolio. This bucket will be the most volatile over the short term and is suitable for individuals with time horizons exceeding ten years and able and willing to withstand the inevitable periods of capital market stress. Post-Divorce Investments – What do I need to plan for now?